but what if they shouldn't? So You Wanna Run An Anime Distribution Company? Everyone thinks that they could run an anime distribution company and run it better than the current executives do. Alright then, see if you can figure out the following problem. If you can come up with the correct answer then you do have bragging rights that you could run such a company; an incorrect response means that you should be relegated to Usenet arguments for the rest of your existence! 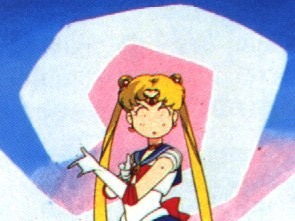 Pioneer Entertainment wants to release 3 different versions of each of the 3 "Sailormoon" animated features. They want to release each version on 2 formats VHS and DVD. But the DVD version can hold 2 or 3 versions of the same feature. A single DVD could hold an uncut, subtitled version; an uncut dubbed version with a different soundtrack and then it is possible to include a dubbed edited version with additional altered visuals & mix. The minimum and maximum number of VHS tapes and DVD disc items to be sold?